Maxi, the Wonderdog, is scheduled for a haircut next week. Poor lamb: with the growing chill in the air he's not going to be totally delighted with that development. 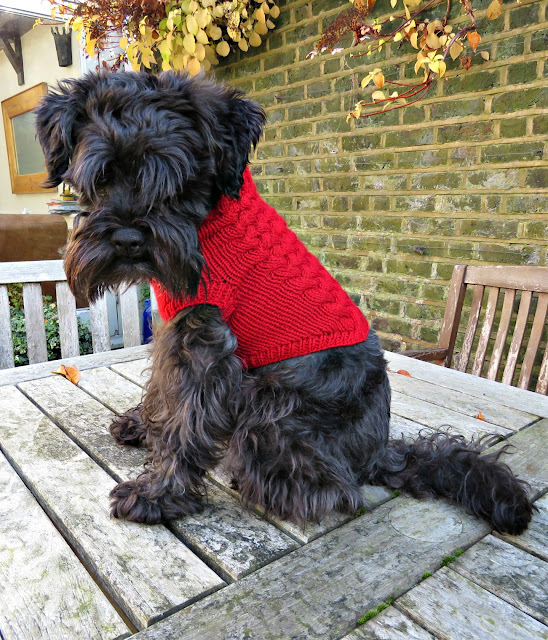 But to lessen the impact of his shorn locks I've knit him a jumper. The jumper is, for the most part, knit in the round, using the magic loop technique. The pattern starts from the neck and works down. On the back there's a basket-weave pseudo-Aran (easy cable) pattern, and the front is stocking stitch. 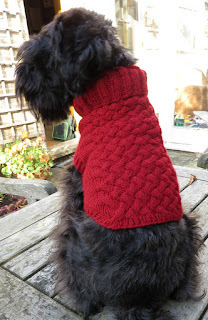 I've knit this using dy choice, Basics DK, double knitting in colour 009, which is a nice rich Rioja colour. 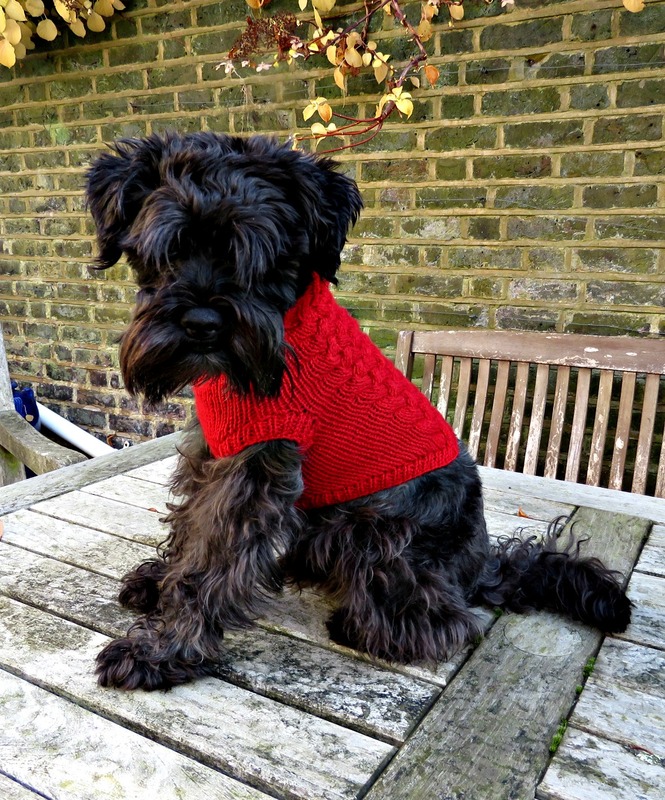 And the sizing in my pattern will fit a small dog. 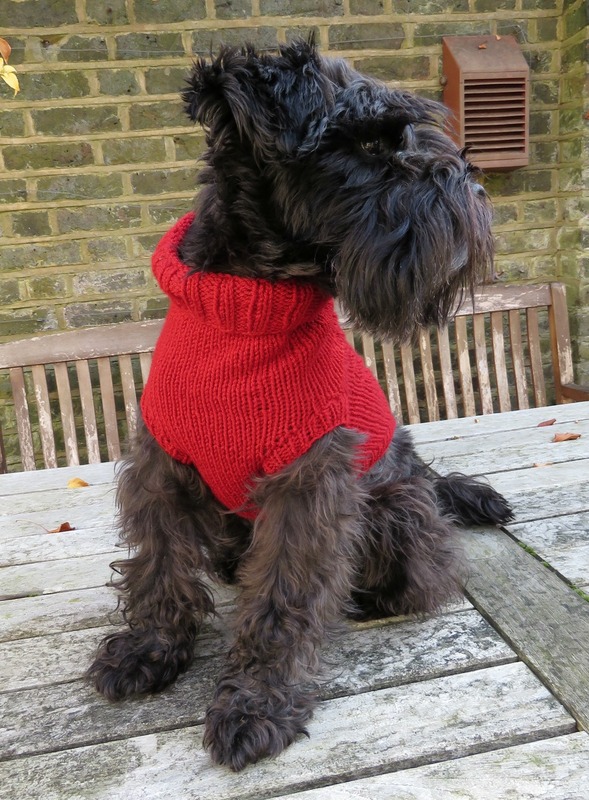 The Wonderdog is a miniature Schnauzer, who stands 34 cm/ 13½" tall at his front shoulder. He's got a chest measurement, taken just behind his front paws, of 46 cm/ 18", and his neck is a very dainty 28cm/ 11". He's a bit of a poppet. My tension (working stocking stitch) was 17 stitches x 27 rows on a 10cm x 10cm, 4" x 4" square. 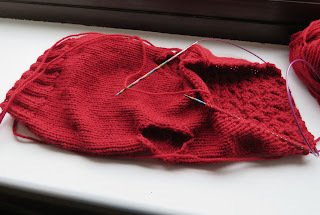 Using 3.25 mm (UK size 10/ US size 3) needles, cast on 72 stitches, join the loop being careful not to get the knitting twisted, mark the beginning of the row with a stitch marker so that you know where you are, and knit in a knit 2, purl 2 rib until the neck of the jumper measures 4 cm. Change your needles to 4mm (UK size 8/ US size 6) needles. You've already marked the beginning of the row with a stitch marker. Now you need to mark the half-way point in the row with another stitch marker. The first half (comprising 36 stitches), between these two markers is going to be the basket-weave patterned back of the jumper, and the second half (comprising the next 36 stitches) is going to be the stocking stitch front of the jumper. Here's the table, showing you how to knit the basket-weave pattern on the back of the jumper. The rows are numbered in red along the right hand margin, and the stitches are numbered in green along the bottom margin. The pattern is worked only on odd numbered (knit) rows. All the even numbered rows are worked as plain knit stitch in the round - or purl when the work is being done on the flat. As you can see this pattern repeats over a multiple of 18 stitches and 15 rows. Cable 3/ knit 3 front means place the first 3 stitches on a cable needle. Leave them at the front of the work, Knit the next 3 stitches from the left hand needle, and then knit the 3 stitches that are on the cable needle to produce a cable twist. Cable 3/ knit 3 back is pretty much the same save that you leave the cable needle at the back of your work whilst you knit the next 3 stitches from the left needle. Work the cable stitch pattern across the first 36 stitches for the back of the jumper using your stitch markers to understand where you start and finish, and then just knit the front half in plain knit stitches. 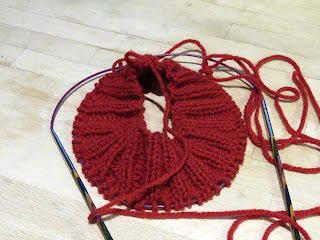 Carry on like this until your work measures 17 cm (including the ribbing at the neck). Now it's time to shape the legs in the front stocking stitch section. First of all we're going to work the section between the legs shaping the leg holes as we go. You need to end on a (wrong-side) purl row. Shaping row 2: Working on the flat, purl back across these 19 stitches. Shaping rows 6 to 10: work in stocking stitch with no decreases. Cut the yarn, and rejoin on the main section of the jumper, leaving the stitches that you have just been working on a stitch holder or a spare needle. The main section across the back will now be worked in the flat with leg hole shaping on the front sections at either side to match that worked in the front between-the-legs section. You work across all of the remaining stitches, knitting the remaining section to match the front section, so that the two can later be joined together and continued in the round without any need for seams. Row 1: K2, psso, knit across to the beginning of the back section, marked by the stitch markers. Work the back section in pattern, knit across the remaining part of the front section on the other side, knitting through the sections of front stitches that were not worked whilst shaping the front. Knit to last 2 stitches, k2tog. Row 3: K2, psso, knit across to the beginning of the back section, marked by the stitch marker. Work the back section in pattern, knit across the remaining part of the front section on the other side to last 2 stitches, k2tog. Row 5: K2, psso, knit across to the beginning of the back section, marked by the stitch marker. Work the back section in pattern, knit across the remaining part of the front section on the other side to last 2 stitches, k2tog. Rows 6 to 10: work in stocking stitch and pattern on the back section with no decreases. Row 17: knit back across the back section and join by continuing the row across the stitches on the stitch holder that make up the between-the-legs front section. 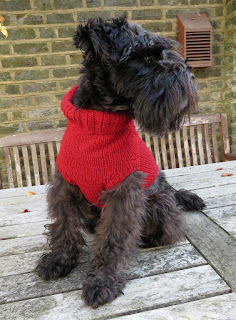 The jumper is now knit in the round again. Insert stitch markers so that you remember where the back and front sections begin and end. To shape the front and the side cut-aways start on a knit row. Row 1: Knit all the way across the back, and knit the first 13 stitches of the front section. Cast off 10 stitches, and knit across the remaining 13 stitches. Row 2: Knit back across all the stitches for the next row, but thereafter we are going to be working in the flat again. Row 4: k1, slip1, psso, knit to last 2 stitches, k 2 tog. Carry on purling all even rows and losing two stitches, one at either side, by using the k1, slip 1, psso, knit to last 2 stitches, k 2 tog formula until you have cast off all of the front section and are working only on the back stitches. Cast off the back section on the next knit row following a cable cross-over row. To finish off: change to 3.25 mm needles to work the ribbing. 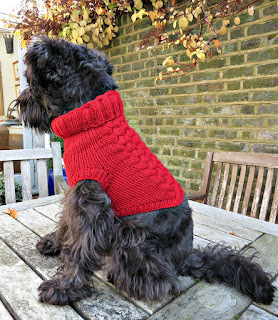 Pick up a total of 42 stitches down both sides and across the tummy section to knit the binding. Work 3 rows in the round in a k1/ p1 rib and then cast off. Pick up 32 stitches around each leg opening using the 3.25 mm needles and work 3 rows of k1/p1 rib in the round to shape the legs. Cast off. 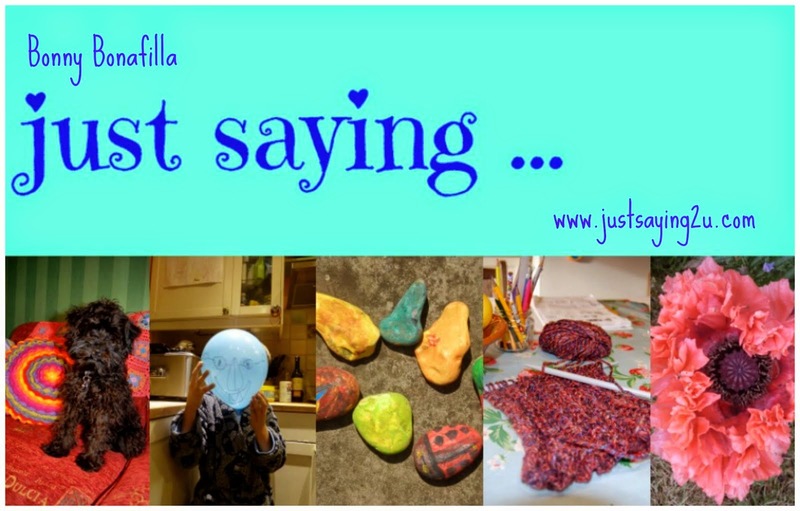 Darn in your loose ends and you're done!